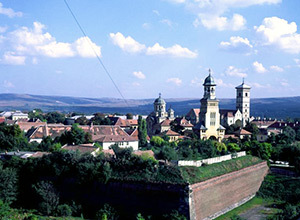 The Alba Iulia Fortress – The Orthodox Cathedral (Catedrala Incoronarii) and the Roman Catholic Cathedral. According to documents, Alba Iulia is mentioned for the first time as being the capital of the Dacia Apulensis district during the reign of Marcus Aurelius. Then, after 1641, it became the capital of the independent Principality of Transylvania, where the Union Act of the Romanian Principalities was signed in 1918. It is also known under the Latin name of Apulum, the Hungarian name of Gyulafehérvár and the German name of Karlsburg/Weißenburg. During the Middle Ages, the Romanian name of the town, written in Slavic, was Balgrad, meaning Cetatea Alba (the White Fortress/Castle). Built between 1714 and 1739 after the plans of the military architect Giovanni Morando Visconti, at the orders of Carol VI of Habsburg, Cetatea Alba Iulia (the Alba Iulia Fortress) is considered to be the most representative Vauban bastion fortification in Transylvania. With its 12 kilometers long walls and covering almost 100 hectare, the fortress is formed of a central fort and seven bastions with Baroque gates. The seven bastions were named “Eugeniu de Savoia” (“Eugene of Savoia”), “Sf. Stefan” (“Saint Stephen”), “Trinitatea” (“the Trinity), “Sf. Mihail” (“Saint Michael”), “Sf. Carol” (“Saint Carol”), “Sf. Capistrano“, (“Saint Capistrano”) and “Sf. Elisabeta” (“Saint Elisabeth”). Bastionul Trinitatii (the Trinity Bastion) is the greatest, measuring 135 meters. Three of the gates face the town, while the other three face the instruction field on the West. The walls are made of bricks and stone gathered from the ruins of the Roman fortress, being three meters broad at the bottom and 1.2 meters at the top. The First Gate of the Alba Iulia Fortress. Built in the first half of the 18th century, the First Gate of the Fortress of Alba Iulia is located at the East extremity, has the form of a triumphal arch and three entrances. Above it, in the centre, there is the coat of arms of the House of Austria (the bicephalous eagle with the sward and the scepter), framed by the statues of Venus and Mars, with two bombers in the shooting position on the sides. On the façade there are represented some scenes from the antique mythology. On the outside there is represented the scene in which Aeneas saves his father from the fires of Troy and the fight scene between Hercules and Anteus. In the inside one can see Perseus with Medusa’s head and Hercules fighting with the lion of Nemeea. 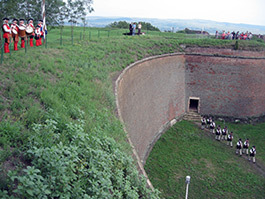 The entrance in the Alba Carolina Fortress. Between 2001 and 2006 Poarta I (the first gate) was renovated. During this period, over 72 percent of the stones of the old gate were replaced, and also the sculptures and the coat of arms were replaced with accurate replicas. The stone used for this renovation was brought from the quarry of Ighiu, 12 kilometers far from Alba Iulia, and it was watertight in order to prevent water infiltration. The level of the gate was also lowered with 80 centimeters, exactly as it was in the first place. The renovators declared that in the 30s, when the Poarta II (the second gate) was demolished, the land was pushed towards Poarta I (the first gate) so that the slope become gentler, burring in this way its base. The gate is watched by guardians wearing the clothes of that time. There are projected renovation works for Poarta a III-a (the third gate), Poarta a V-a (the fifth gate) and Poarta a VI-a (the sixth gate) in the future. Moreover, there is also stipulated the reconstruction of Poarta a II-a (the second gate), of which only the traces of the side pillars are to be seen today. 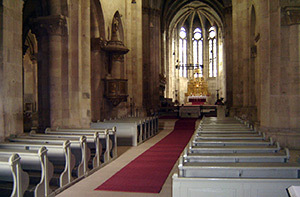 The Roman Catholic Cathedral – Alba Iulia. The tourists coming for the first time in Alba Iulia can also visit Catedrala Romano-catolica (the Roman Catholic Cathedral), the most valuable monument for the medieval architecture in Transylvania, inside which can be found the tomb of Iancu de Hunedoara (John Hunyadi). We should not forget Muzeul Unirii (the Union Museum), the place where the Union Act between Transylvania and Romania was signed on 1st December 1918. This was built in 1898 as a casino for the Austro-Hungarian officers. It became a museum in 1968, sheltering several history departments, a library and a permanent ethnographic exhibition which stresses Transylvania’s history. Mihai Viteazu’s (Michael the Brave) equestrian statue (the masterpiece of sculptor Oscar Han) was also unveiled in 1968. The opening of the Museum and unveiling of Mihai Viteazul’s (Michael the Brave) statue took place on the occasion of the semi centenary celebration of the Union between Transylvania and Romania. The Orthodox Cathedral (Catedrala Incoronarii) – Alba Iulia. The princely palace of Alba Iulia, the former residence of domnitor Mihai Viteazu (Michael the Brave) dates from 5 centuries ago. In 1975, on the celebration of 375 years from the first political union of the Romanian Countries , the bas- relief called “Unirea Tarilor Romane”(the Union of the Romanian Principalities) (the work of sculptor Horia Flamand) was unveiled. We should also mention Obeliscul (the Obelisk), (the work of sculptor I. Fekete and architect O.Mihailean), with a high of 22.5 meters, located on the Furcilor Hill, at the entrance in Alba Iulia. This one was built in 1937 in the memory of the three peasants that run the uprising of 1784, Horea, Closca and Crisan, and who were tortured and killed at the order of the Habsburgs. Batthyaneum library has also an important part in the cultural heritage of the town, library that is sheltered by a building that was built in 1784 and that belonged to a monastery. The library, one of the most valuable in Romania, was founded by bishop Batthyaneum. The building shelters over 55 000 books, 19 000 documents, 1230 manuscripts and over 600 incunabulums. The first modern astronomic observatory in Romania (1779) is also to be found here. In 1933 Alessandria town, from northern Italy donated to the town of Alba Iulia a copy of “Statuia Lupoaicei” (“Lupa Capitolina” “Capitoline Wolf”), as a sign of the recognition of their common Latin cultural inheritance. The official opening of “Piata Allessandria” (the “Allessandria Square”), place where the “Lupa Capitolina” (“Capitoline Wolf”) is located, took place only in 2007. 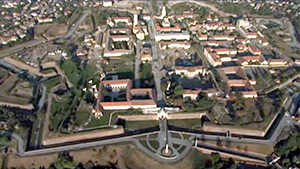 The Alba Carolina Fortress, Alba Iulia. 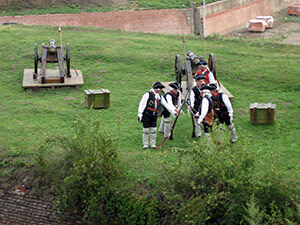 The army that serves for the White Fortress Carolina consists of more than 50 soldiers, all dressed up in uniforms specific to the first half of the 18th century. The army is divided into three groups: cavalry, infantry and artillery (the soldiers wear different types of uniforms according to which group they belong to). Every day, at lunch time, the tourists and inhabitants may witness the ceremony of the guard changing. Till April 2008, this ceremony was organized only Saturdays. From that point on, these soldiers can be seen every day in the fortress. The most impressive ones are the soldiers belonging to the cavalry corps. They have 7 horses at their disposal, 6 of which are of Frisian origin (they are black, beautiful and brought from Holland). At visitors’ disposal, there are also several old fashioned gigs, pulled by Romanian, beautiful and well-groomed horses. Every day, at lunch time, the tourists and inhabitants may witness the ceremony of the guard changing. Till April 2008, this ceremony was organized only Saturdays. From that point on, these soldiers can be seen every day in the fortress. 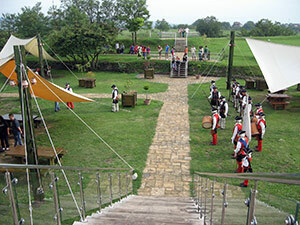 In April 2008, in the celebration day of the fortress, a new mobile bridge was inaugurated at the Third Gate of the fortress, gate that had been finally restored at the end of 2007, after nearly one decade of hard work. The bridge was rebuilt according to its initial plans which are placed in an archive in Vienna. The last documentary mentioning regarding this bridge dates from 1849, when Alba Iulia was attacked during the revolution. It is not known under what circumstances the mobile bridge disappeared then. It is known, though, that the moat of the bridge was covered up with earth. The rebuilding of the mobile bridge is a project included in the restoration programme of the Third Gate. This is the most imposing gate, among all 6 of them, and became eventually a public and tourist sight in December 2008, after 10 years of restoration works. For a whole decade, the Third Gate has been hidden from the inhabitants of the city and from tourists, as well. 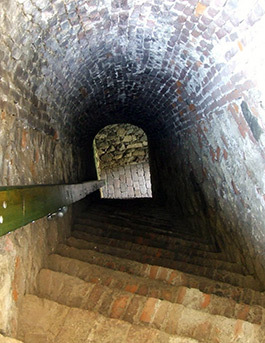 Near the Third Gate of the fortress, one may find out Horea’s cell. 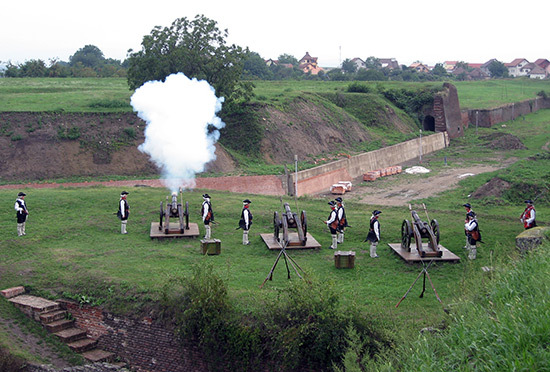 The citadel was designed to be the main defensive point of Transylvania, a military centre and arm storage facility. It is composed of 7 bastions conferring it the star shape, characteristic to such citadels. A complete visit of the fortress takes about four hours. 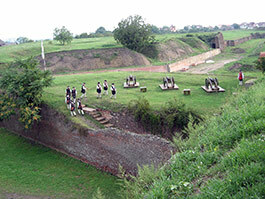 The price of a ticket for the Museum is 5 lei, and for the tour of the Trei Fortificatii (Three Fortifications) is 10 lei. 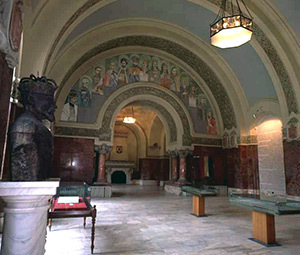 Those who would also like a guide should pay 20 lei more for the Museum and Sala Unirii (the Union Room) or 25 lei for the entire fortress. Visitors may park their cars for free in the Platoul Romanilor (the Romanians’ Plateau) area. In what concerns the accommodation, there are many motels and boarding houses and also three hotels. Alba Iulia can be reached by train from every corner of the country. There are trains from Iasi to Timisoara and back, or the Timisoara – Sighetul Marmatiei, Bucuresti – Curtici, Cluj – Bucuresti, Timisoara – Galati routes, and many other trains that pass through Alba Iulia as well. The Alba Carolina Fortress – Alba Iulia. 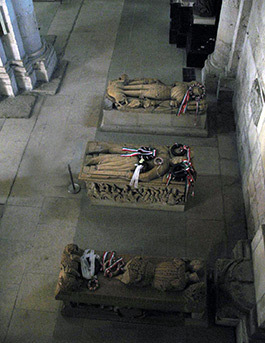 Iancu of Hunedoara`s sarcophagus next to those of his elder son Ladislau – The Roman Catholic Cathedral, Alba Iulia. 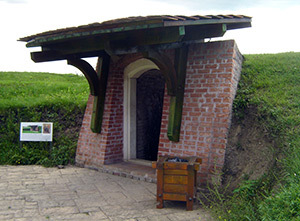 The entrance in the Alba Carolina Fortress – Alba Iulia. I am trying to locate a man named Zenu Coc in Alba Iulia. It is important that I find him. Can you provide information.